UK eBay vendor the-fancy-fox-antiques has on offer what appears to be a rare and unusual cloisonne artifact made post-Liberation (after 1949), perhaps during the Cultural Revolution (1966-1976). She has kindly granted permission to use her photos here, in hopes of generating some discussion about this vase. It is a larger piece, 13 inches high. I left the photos at original size in order to show fine details, so just keep scrolling to reach the text discussion following them. 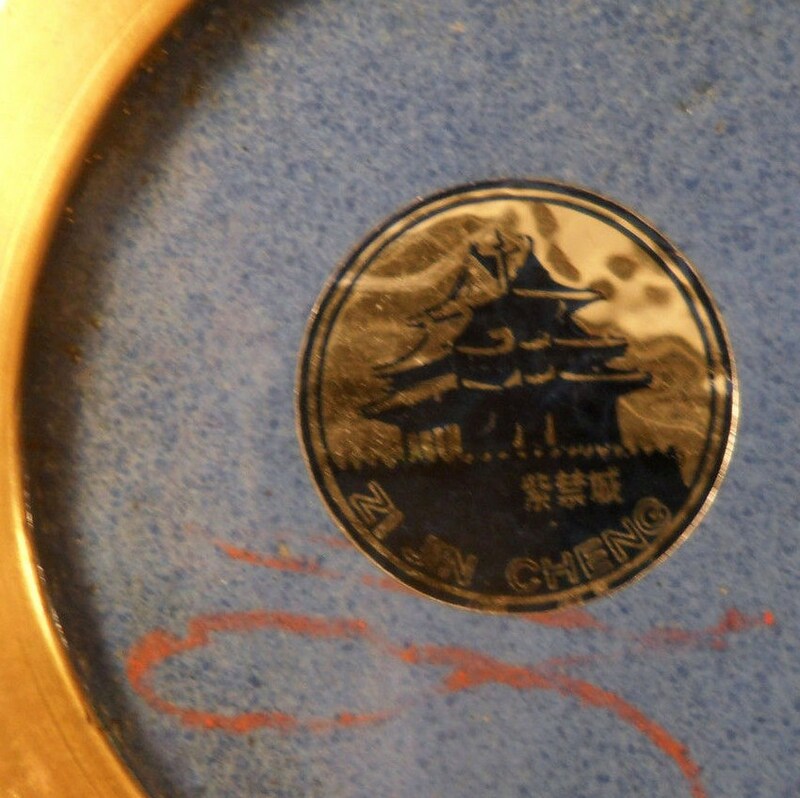 However, the Chinese version of this enamel is much finer-grained, with the sparkles more resembling glitter. Here are two vases from my collection which feature sparing use of the copper aventurine enamel, in contrast to the vase under discussion. The small coppery brown areas are aventurine enamel. This vase has an unusual provenance, reportedly having served as a lamp (it has the requisite base hole) in the Minnesota home of a well-to-do Korean family in the 1960s. The aventurine enamel is used sparingly, appearing only in leafy scroll motifs at top and bottom. The diamond net background diaper can be seen in this pair of large vases, for which I have the box with a ZiJinCheng logo, which seems to be circa 1970s-80s. The small red logo at upper right says "Zi Jin Cheng"
Zi Jin Cheng sticker on base of another vase pair (not the pair pictured above). A sunflower has been substituted for the traditional lotus in the blue scroll pattern around the neck. Elaborate and uncommonly used background diaper. 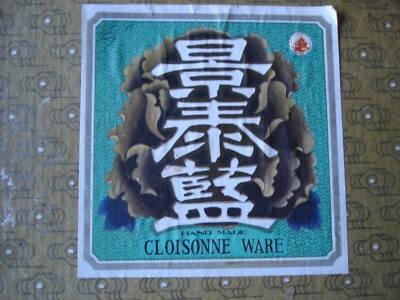 The seller stated that this vase was purchased in Beijing in 1972. During the Cultural Revolution of 1966-76, Chairman Mao Zedong was represented as the Sun with the Chinese people as sunflowers turning their faces toward him. Vases with scenes similar to the example above are pictured in a biography of cloisonne artist Qian MeiHua. A correspondent with whom I shared pictures of the "Red Army Women" vase sent a link to the ChinesePosters.net site featuring Chinese propaganda posters. The section on women is well worth viewing. I stumbled upon your blog while researching a vintage Kimono sash holder (I think it is called an Obidome) I have. I found this post most interesting and informative. Thank you so much for sharing...I may be back when I start researching some Japanese vases I have, lol...Gorgeous! The dragon beads in particular seem to show up on things in Japan, possibly a result of the Japanese occupation of China 1937-45. I found your posts are very informative. You seem have a great collection of Cloisonne. This is first time I saw a cloisonne with motif of a cultural revolution motif. Thanks a lot. 8, 1977 (T10). Triangular-shape stamps are very rare in China. If I remember correctly, only one kind was issued before 1990s, in 1951.